I reviewed this book on PatternReview shortly after it came out, and thought I'd share here if you haven't seen it yet. Another beautifully designed and illustrated, smart, fun and inspirational book from Wendy Mullin! 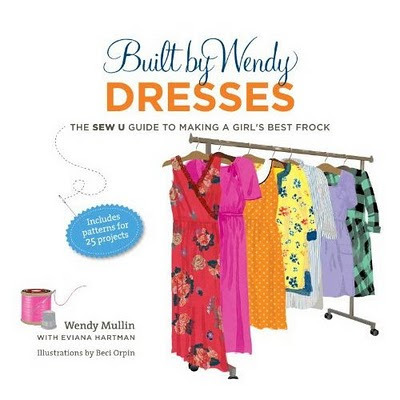 Built By Wendy Dresses: The Sew U Guide to Making a Girl's Best Frock encourages even relatively beginning sewers to take basic dress patterns and adapt them to make the dresses of their dreams. In no time you'll be slashing and spreading, drafting facings and collars and linings, adjusting length and fullness, playing with necklines and sleeves, adding flounces... In other words, drafting and pattern-making! Only less scary somehow. However, unlike her previous two books (Sew U and Sew U Home Stretch), this book is probably most beneficial to the advanced beginner or intermediate sewer--or even a more advanced sewer looking to break away from just making commercial patterns to deconstructing and designing her own. A true beginner would be better off starting with more basic books. A loose-fitting one-piece shift dress with horizontal bust darts. This style isn't for me, but at the Brooklyn BurdaStyle sewing club meetup this past weekend, I saw two lovely variations made from this pattern. NOTE CAREFULLY THAT THESE PATTERNS HAVE NO SEAM ALLOWANCES! This is different from her previous two books, and a welcome change, as it allows for easier pattern alteration. These are basically used throughout the book as blocks or slopers to create 25 total dress variations, though they already have more styling/design/ease built in then a close-fitting neutral Big 4 fitting shell/sloper pattern (like this one) does. They are intended to be traced so they can be re-used and reshaped as needed. That said, you don't need to actually use these patterns if you don't want to--this book could just as easily inspire you to make design changes (drastic or basic) to other commercial patterns or slopers. Some of the 25 variations seem to skew a little bit young/cute/trendy (or just too shapeless for my liking, especially in the shift dress chapter)--I won't be making the overall dress anytime soon! Still, there is something in here for every dress lover--sun dresses, work dresses, dresses with empire waists, drawstring dresses, mod-style dresses, tunic dresses, a shirt dress, party dresses, a fitted LBD, a (woven) wrap dress. And every variation includes detailed illustrated instructions for altering the block pattern, drafting facings and collar pieces, and construction. This book inspires. It gives advice and ideas on designing and constructing a wide variety of fun dresses and on choosing fabrics and experimenting with design details. Anyone spending time on any of these projects would learn valuable drafting skills and gain confidence to play with existing dress patterns to make them her own. I particularly loved the fun spreads with line drawings showing different kinds of collars, hems, necklines, sleeves and hemlines. There's even a (little) bit of advice at the end on altering thrifted dresses or cutting apart old clothes to make new dresses. There are some rudimentary notes on sewing and finishing techniques and basic attention paid to zippers and buttons, but it's quite basic--you'd probably want to use a more comprehensive reference on finishings and closures in conjunction with this book (like my beloved The New Complete Guide to Sewing). And this is most definitely NOT a fitting book--there are a few basic pages where she asks you to analyze your figure in the usual "hourglass" "pear" etc. manner, and gives basic suggestions on what to do if a dress is too tight or loose in the bust or hips... but I wouldn't use any of her fitting techniques, especially if you're, say, full-busted. For example, she makes no mention of altering darts--her instructions for fitting a pattern that's too tight in the chest are to just to enlarge the side seams--a terrible idea and sure to result in a poor fit! Instead, I'd suggest fitting the block patterns to your liking using a book like Fit For Real People, and THEN trying the design variations. In sum, this fun and fabulous dress cookbook is definitely a MUST HAVE for those looking to branch out from just making commercial patterns to playing with drafting and design details. Make the dresses of your dreams! Finally, this book makes an interesting companion with Adele P. Margolis' 1985 classic Make Your Own Dress Patterns. It's much more of a detailed pattern drafting book, but also very inspirational and encouraging, and the two really complement each other. I used both in conjunction when redrafting the front bodice/skirt for my orange silk floral maternity dress. Thanks for this review. I'm a real beginner, and I have all of the Built by Wendy books. Thank you for the additional recommendations. I will have to add them to my shelf! I pre ordered this book and read it all in one sitting. I like it a lot but I agree that she doesn't really turn her attention to curvy women - and by that I mean relatively narrow people with large breasts. I think I mentioned that I haven't tackled the FBA yet - though I do have the FFRP and the Full Bust video. And the fitting pattern (McCall's version). And all the required props the book says I'll need. I'm still intimidated but I'm getting closer to putting the principles into action. 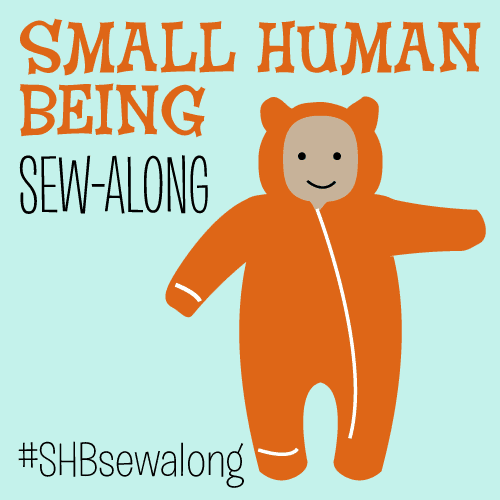 And once I've got that sorted, I think I'll feel more comfortable sewing woven everything. That Full Busted DVD is great, I have it too. But really, FBAs are NOT that scary. Just start with a simple one--like a basic sheath dress bodice that has both a horizontal dart and a vertical dart. Sit down with the FFRP book and follow the clear instructions. I know they suggest using tissue fitting, but I prefer to trace the bodice pattern (so I don't screw it up), compare the final bust size to the final bust size I want (taking ease into account), make a muslin from my adjusted bodice pattern, then decide if I need more or less of an FBA. You can do it!